Enjoy best party of years with our girls! 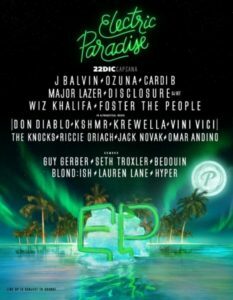 Electric paradise Music & Arts Festival 2018 lands on the paradise coastline of Cap Cana this December 22nd pushing boundaries of imagination. The fourth edition includes the genres of urban, electronic, indie, pop & the underground scene and will bring fresh new experiences to the island, involving gastronomy with a mix of top street Chefs, art, technology and innovation, where thousands of people will join to live a night where their dreams will become reality.